Reports by Richard L. Watson, Ph.D. and others. Some of these documents are very large pdf files so be patient. Why is a sand bar forming in Packery Channel? Click here to read Dr. Watson's invited article titled "Evaluation of coastal response to Hurricane Ike through pre-storm and post-storm aerial photography" in Shore and Beach Vol. 77, No. 2, 49-59. 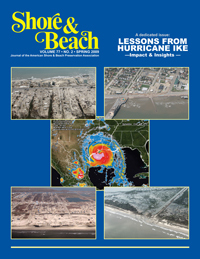 This entire issue of Shore and Beach, the Journal of the American Shore and Beach Preservation Association is dedicated to description and analysis of the damage to the Louisiana and Texas coasts by Hurricane Ike which came ashore on September 13, 2008. See also paper by Kraus & Lin below. This paper shows sea level rise for the next 90 years projected from past sea level rise as measured by the Rockport and Galveston tide gauges. It shows projected future maps of shorelines and marshes. Click here to see a Packery Channel Monitoring update presented to the City of Corpus Christi in April 2010. Fabulous Port Aransas by Miller Harwood and W.A. Scrivener, 1949, A History of Port Aransas, Aransas Pass, Copano, Corpus Christi and the surrounding area with emphasis on the development of shipping and waterways. This is presented in two parts. Be patient, Part 1 is 8 megabytes and Part 2 is 14 megabytes.